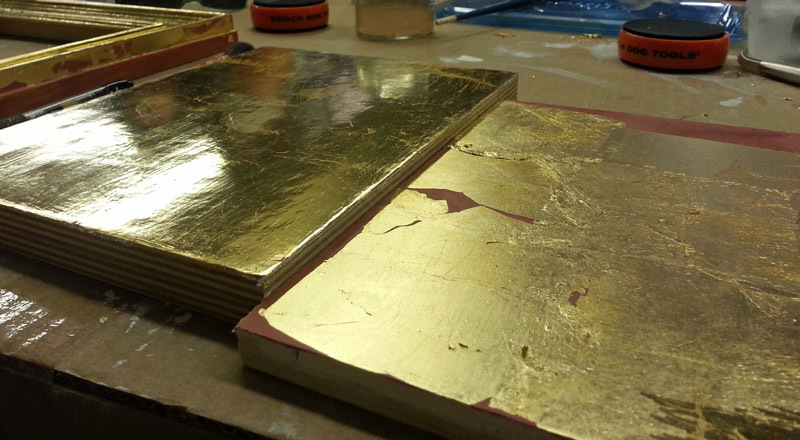 Last spring, I had the pleasure of participating in a water gilding class taught by Jill London from the Society of Gilders. 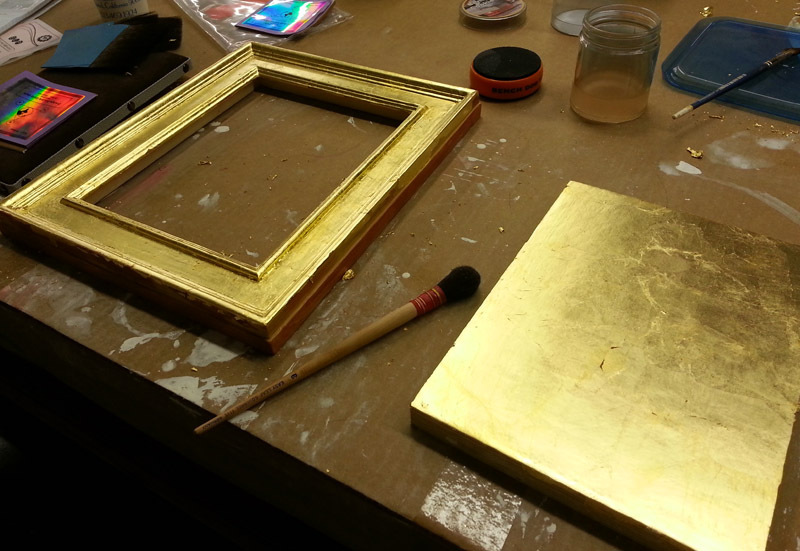 I wanted to learn best practices from someone who does primarily gilding, and has for 30 years. The prior year I had taken her oil gilding class, which was also excellent, but what I really wanted to learn was water gilding. It is the traditional way that artists and iconographers gilded their panels in the past and the more natural choice for gilding over porous gesso. With her permission I brought a couple of flat panels to experiment with in addition to the picture frame that all of us gilded together. On the first day she taught us to make gesso (the white ground beneath water gilded surfaces), and we applied it to our frames (and panel). On day 2, we wet-sanded the gesso smooth, made the clay bole together (the base for water gilding), and applied it in thin layers one after the other. Several thin layers is much more stable than one thick layer. 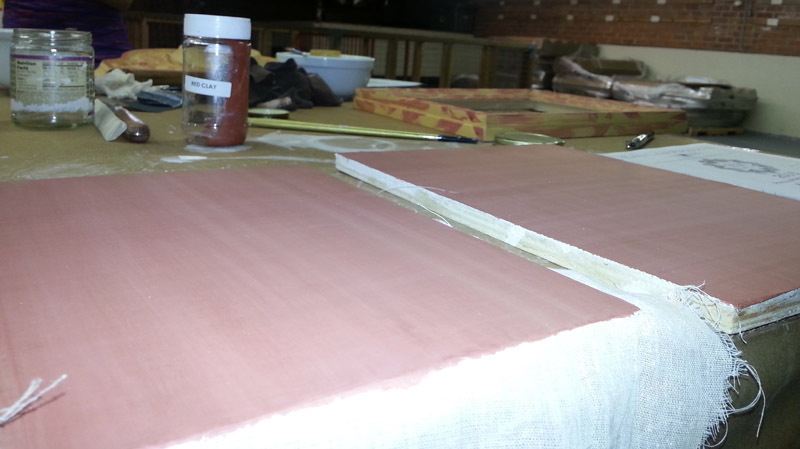 The red bole dried to a pink color and a very smooth finish. On day 3 it was time to gild, and that was the scary part! Loose gold leaf takes a considerable amount of practice to learn to handle without tearing it, or watching it in dismay as it flies away! I find that the more calm and centered I feel, the better the process goes. After a few hours we burnished the frames. Burnishing the gold brought it up from a matte finish to a mirrorlike shine. We iconographers have a tendency to get perfectionistic and fussy, so Day 4 was an interesting experience for me. We started out with a trip to the Getty Museum, where Jill led us on a guided tour of the frames. We learned to distinguish an old frame from one that had been artificially distressed to look old or to match something else. We saw many different ways in which the gilding can get damaged by normal wear and tear. Then we went back to the studio and distressed our own frames. To be quite honest, I felt a little bit “naughty” during this process, and it was strangely fun. I’m normally in the habit of fussing and fussing and wanting everything to look even and uniform with no visible flaws. And here I had the opportunity to just have at it! Instead of out-and-out distressing the panels, I experimented with toning down the mirror-like shine of the burnished gold, softening its appearance. I would never go beyond toning to try making a new icon “look old.” People can be very nostalgic about “old icons,” but we must always remember that even those “old icons” were at one time brand new. To make a new icon look “old” with distressing makes the statement that there is something wrong with a new icon. But why would there be? Isn’t Christ able to come to us now and meet us as we are? Jill and I had several conversations that week about “perfection” versus visual interest through varying textures. I appreciated her 6-6 rule: what looks good at 6 inches will look boring at 6 feet; what looks imperfect at 6 inches will not be noticed at 6 feet. I saw how in regular gilding and in art that is viewed at a distance, tiny imperfections are not important. For a panel icon, once the painting is done, small flaws in gilding fade into the background — or at least they should, if the painting is done well and the colors chosen with the background gilding in mind, because the face should always command the viewer’s attention. Although in icons we strive for a consistent surface, the presence of a small mark here and there underscores the fact that the piece is hand made, by a living person, and therefore devoid of soul-less factory-machined uniformity. 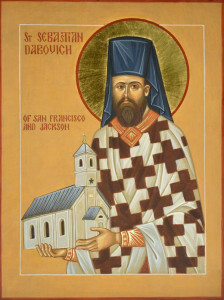 It’s great to see an iconographer blogging! I’m don’t know of many that do. 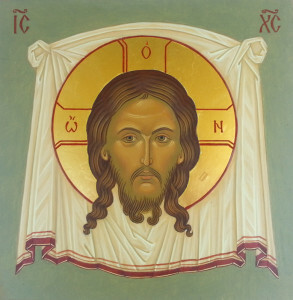 I started studying iconography seven years ago. 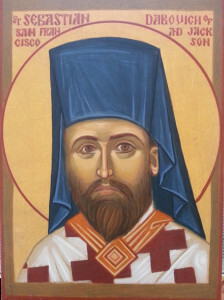 I don’t have time to do solo commissions but I work together with another iconographer. I have been doing most of the gilding, lettering, and gold assist. I just wanted to tell you that the icon of St. Ignatius with the water guilding is really beautiful! It seems to have a brighter palette than most of your other icons and the way the colors work together creates such warmth and radiance. Are you experimenting with some new pigments or techniques? Thank you for your kind words about St Ignatius! He is made with all the same pigments that I normally use. : ) They are almost all natural, historic pigments, with the exception of ultramarine blue light (substituting for lapis lazuli), but I tone it down with earth pigments so it blends better with the natural palette. I have brightened the faces in the past year or two compared to how I used to work, but several icons on the site are all lit that same way (the 5×7 face series, St Sebastian, Holy Trinity, St Callista), so maybe it’s a trick of photography? Be the first to see new blog posts and new icons as I post them to the site, and go behind the scenes in my studio.